Imagine a world where conflict is seen as a natural part of social life, as an opportunity to better ourselves and our relationships. Imagine a culture of Conflict Done Well, where we train ourselves to demonstrate compassion, integrity, and presence during confrontation. How would your daily interactions change—with your boss, your significant other, the stranger cutting in line at the grocery store? How much more would you speak your truth? How much more would you trust others? How much more would you forgive and understand? If we can create this culture, how will the world change? If conflict were seen as normal, expected, everyone could train for Peace like you would a martial art. We would expect nonviolent responses to all kinds of conflict, for this learning to be a daily part of general education, and this Martial Nonviolence would be a pre-requisite for any leadership position. Without practice, even these best of intentions can fall by the wayside under the intense pressure of complex situations. Now more than ever, there is an urgent need for a mastery of peaceful action in moments of conflict. The problems we face today seem to be growing, despite sincere commitments to end them. How is it that terrorist attacks and industrial warfare are still possible, when so many around the world aspire to live in peace? That was the question most raised at Training Across Borders 2015, the international conference at which curriculum author Brandon WilliamsCraig was invited to introduce Peace Practices to leaders who practice the peaceful art of aikido (a core part of his curriculum) while living in conflict zones. Aikido practitioners from around the world gathered to train together and build relationships, because aikido practice can reveal whatever stops us from practicing peace when we are faced with conflict. These conflict professionals noticed their own avoidance of difficult issues, even while sharing tools for reshaping the fear of conflict into an opportunity to train in nonviolence. As colleagues, we noticed how easy it is to play it safe, to do whatever we have always done. Perhaps this is what Peace Practices really offers during this season of gratitude and new beginnings. One can discover a new practice of peace on earth, and resolve to keep a "beginner's mind" once again, and return to being a student so that we might all train together. 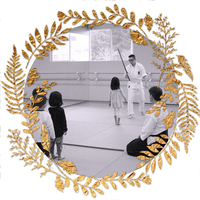 Peace Practices uses the art and philosophy of Aikido to provide concrete physical, verbal, and mental skills to move beyond good intentions and actively create peace under pressure with body, words, and thought. As a one of a kind curriculum that applies verbal and physical nonviolence to real-world conflicts, Peace Practices is a map to peace at the local, national, and international level. But we need your help to get this curriculum into the hands of teachers and the hearts of children around the world. Supporting Peace Practices through a donation, helps us directly and immensely. An introduction to a philanthropist you know, or to a friend with a passion for finding funding to make the world a better place would widen our horizon and deepen our impact. A gift of your time can make a new relationship or deepen our existing sense of community - of working together to really make a difference. During the holiday season we come together in gratitude and celebration, and open our hearts to helping others and to making the world a better place. (1) This year, your generosity can help thousands of students learn to create a more peaceful world through practice. If you wish for Peace on Earth, now you have the opportunity to directly support and join alongside those who work for peace. We are ready to bring classes, instructional videos, group facilitations, and toolkits that can reach around the world, through translation and peace partnership projects, into classrooms and board rooms. We have local, national, and international partners, all of whose fingers are crossed that you will help expand our organization’s capacity to reach them. Your donation toward our $15,000 goal can put a map toward Peace on Earth in the hands of thousands more students (2) of all backgrounds and position us to better meet leaders across diverse communities who are ready to commit to a trained peaceful existence. Together we can shift from avoiding or escalating conflict toward actively training ourselves and our children in peaceful means for when it matter most. 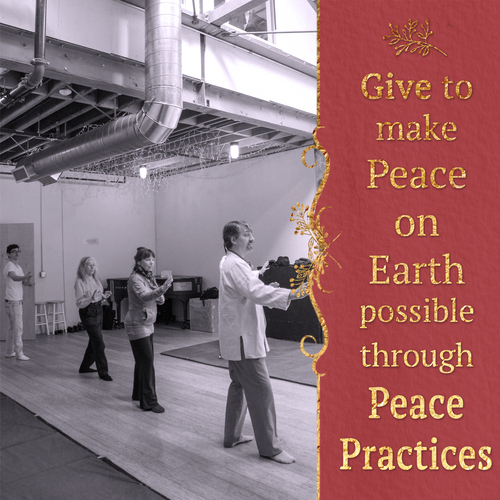 Learn more about Peace Practices, and watch videos of some of our children's classes here. Donate and Volunteers! Share the opportunity of learning Peace. We also welcome in-kind gifts. Please see our wishlist here. Please share this message and multiply your impact. (1) This is the time of year that charitable giving reaches its highest level. A Blackbaud Idea Lab report (https://www.blackbaud.com/files/resources/downloads/2014/2013.CharitableGivingReport.pdf) looking at 2013 showed that over 33 percent of charitable giving happened from October 2013 through the end of the year, with 17.5 percent in December alone. This year, as you decide where you will invest your generosity, let's make a commitment together that we can take action on in a very real way: a communal new year’s resolution that allows thousands of students to be impacted this next year and positions Peace Practices to serve more communities. (2) To put our goal in context, $15,000 could pay for 3 classes a week for 3,120 potential students for one year, and portable mats which can be brought to open spaces wherever folks are ready to train. We are committed to both partnering with institutions and making entirely free classes available so that there are no obstacles to practicing peace. $4,914 for 4.5 average base admin. hours a week over a year of meetings with community leaders, ongoing location sourcing, safety requirements and accreditations, partnership building with local communities, and promotion of classes.